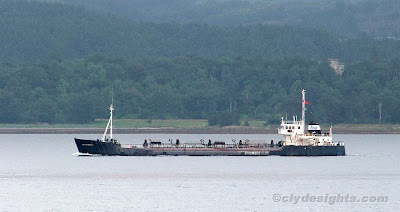 Passing Lunderston Bay, the coastal tanker HENTY PIONEER was heading for Glasgow, where she would await the arrival of another vessel to which she would supply bunkers. HENTY PIONEER was built in Denmark in 1985 as BLACKFRIARS, her original owners being Bowker and King. In 2006, she was acquired by Henty Oil and renamed. She is 69.9 metres overall, with a deadweight of 1,674 tonnes. She still flies the Red Ensign.